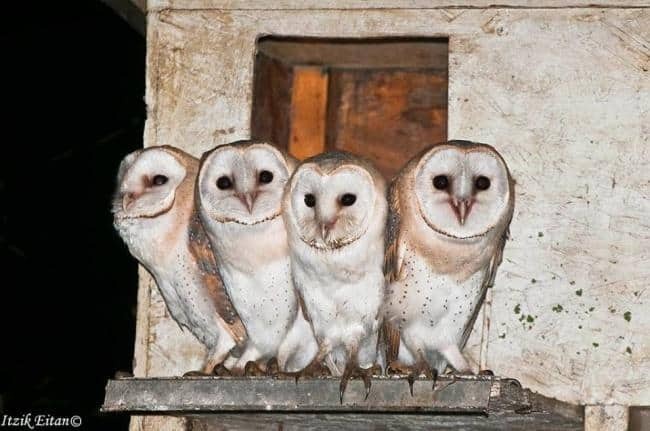 In 2013 a male Barn Owl, with two females and 17 nestlings that fledged, out of the 20 eggs that were laid in an abandoned waterhole on the Judean Plain. As far as we know, this is the first documented case in Israel and perhaps in the world. The breeding cycle and the photographs were recorded by Ezra Haddad, an inspector of the Israel Nature & Parks Authority. 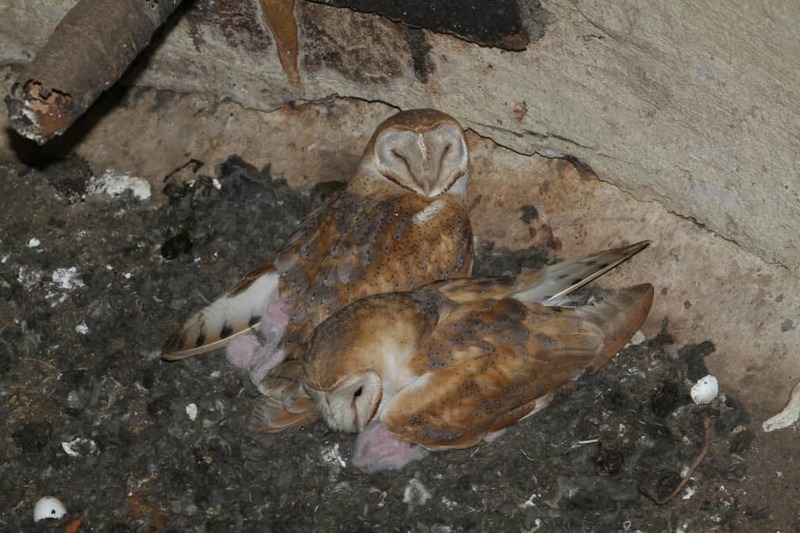 The national project on the use of Barn Owls and Kestrels as biological pest control agents in agriculture celebrates its 6th year (2008-2013) and the erection of 3,000 nesting boxes! In 2013 a male Barn Owl, with two females (bigamy) and 17 nestlings that fledged, out of the 20 eggs that were laid in an abandoned waterhole on the Judean Plain. The 2 females incubating the 20 eggs together. 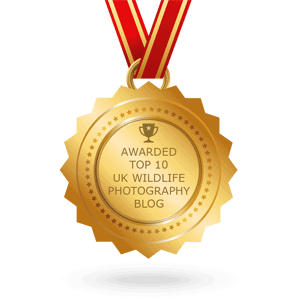 The Barn Owl Project was created in the field. Scientists and bird lovers understood the benefits of the Barn Owl to agriculture, erected nesting boxes in agricultural fields. The enterprise proved to be successful and it was expanded to become the national model for biological pest control using Barn Owls and Kestrels that was also expanded to Jordan and the Palestinian Authority. The national project is under the auspices of the Ministry of Agriculture, the Ministry of Environmental Protection, the Ministry of Regional Cooperation, the Hanns Seidel Foundation, the Hoopoe Foundation, Tel Aviv University and the Society for the Protection of Nature in Israel, and it covers all sections of the country. Nesting boxes are erected in agricultural fields and their numbers are increasing. Today, thanks to the fruitful cooperation with the farmers, we can be proud of the 3,000 nesting boxes in use. The two females that incubated 20 eggs (bigamy) with a brood patch on the belly. 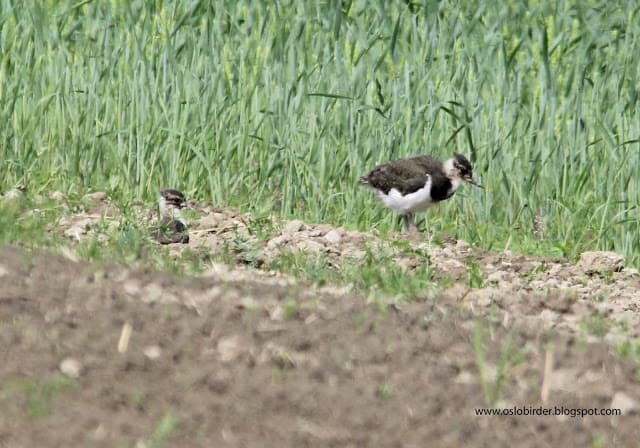 The team working on the project includes professional birders in the field, developing the contact with the farmers, monitoring the nesting boxes, leading research, increasing awareness and educational activities. 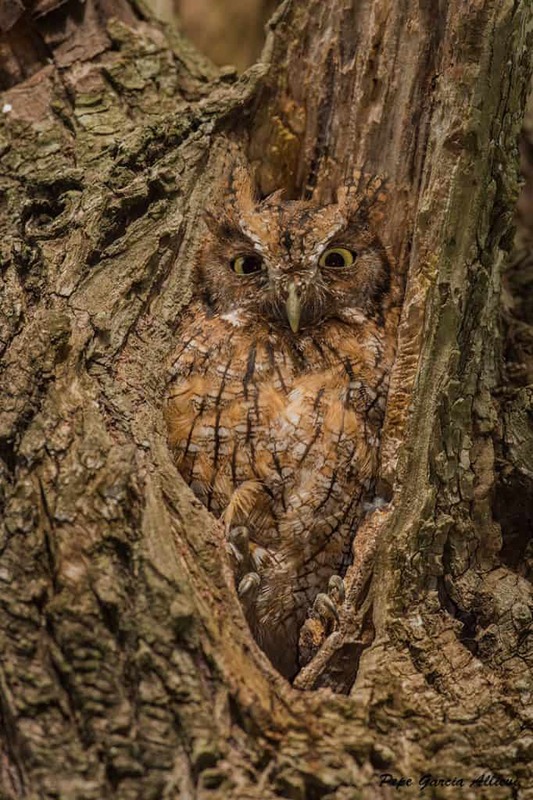 The number of nestlings raised also changes in the different areas. In some areas the number of nestlings that fledged ranged from 5.7 to 6.1 nestlings (the Hula, Negev, Jezreel Valley, Golan), while in the other areas the number was between 2.6 to 4.9 nestlings. (Beit Shean valley). 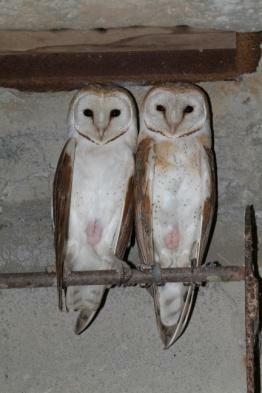 The year 2013 was a special year for the Barn Owls in the Negev. During this period the occupation rate of the nesting boxes in the Western Negev rose from 35% (in 2010-2012) to 66%, and the average number of nestlings that fledged rose from 4 nestlings in a nest to 5.4. 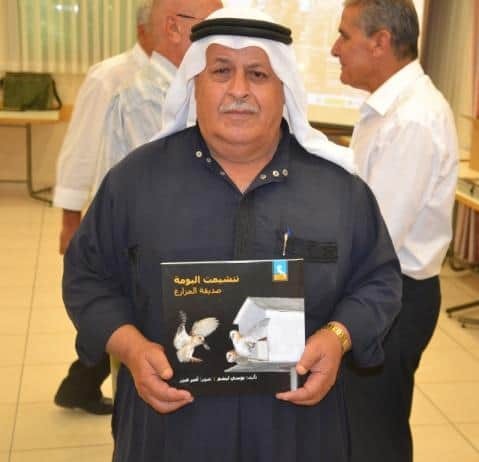 This year we organized conferences in Jordan and Israel on the use of Barn Owls and Kestrels as biological pest control agents under the auspices of General Mansour Abu Rashid and the Hanns Seidel Foundation. The contacts that were made are a model for regional cooperation, professional and effective, as well as for social connections between nations. 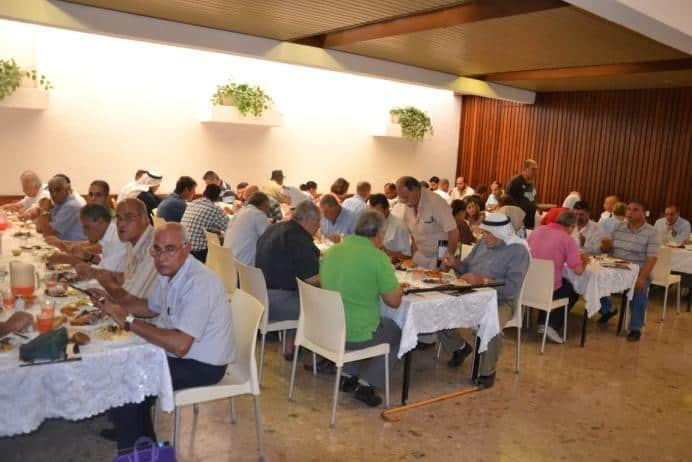 40 Arab farmers from Israel with another 40 farmers from Jordan & the Palestinian Authority enjoying lunch together at Kibbutz Sde Eliyahu. Another special shared experience. The warm relationship among the representatives of the three countries encouraged a different attitude to the Barn Owls, and, from being a sworn enemy, it became appreciated and blessed, especially in the agricultural fields of Jordan and the Palestinian areas. 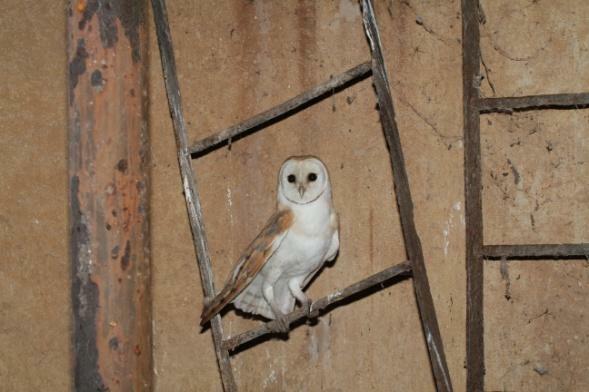 The Barn Owl is useful to the farmers who have warmly accepted its existence and have become ambassadors of biological pest control instead of the intensive use of chemical pesticides. 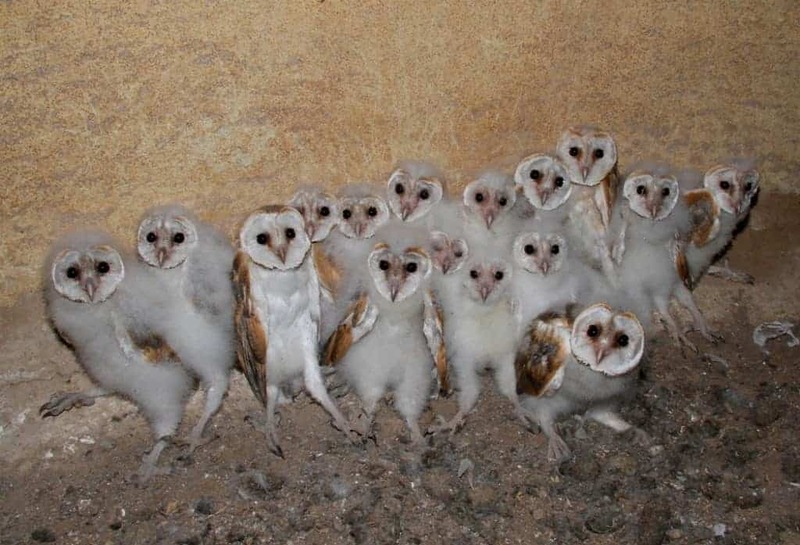 As an example of the change in perception, a farmer from the Jordan Valley, Jordan, who took part in the meeting exclaimed: “I looked into its eyes (of the Barn Owl) and fell in love with it”. 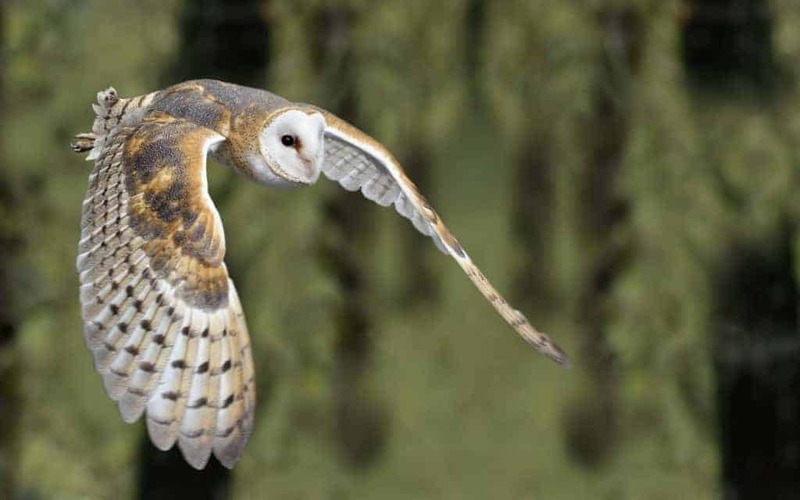 Taiwan government joins the project for using Barn Owls and Kestrels as biological pest control agents in agriculture. The success story of the use of Barn Owls and Kestrels as biological pest control agents in agriculture expanded this year to far off places and reached Taiwan, in the Far East! Left to right: H.E. Lin Jinn-Jong, Director General, Ministry of Foreign Affairs, H.E. 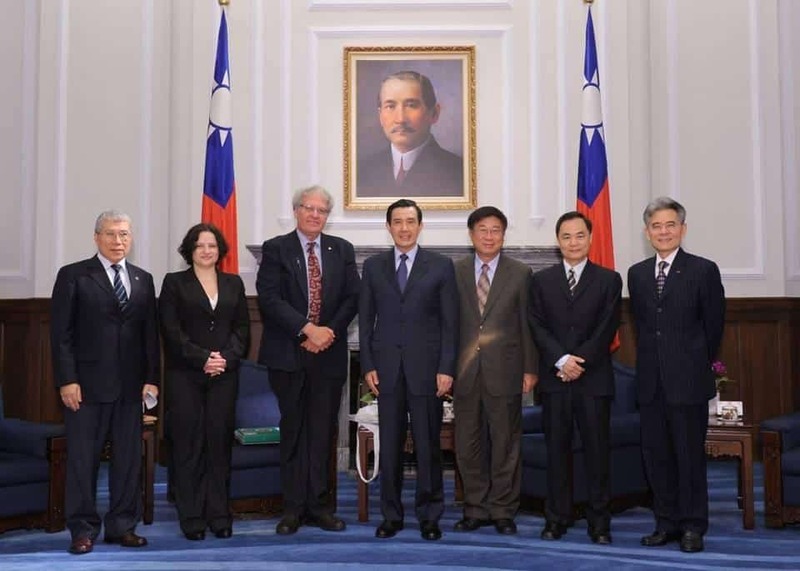 Simona Halperin, Ambassadress of Israel to Taiwan, Prof. Yossi Leshem, President Ma Ying-Jeou, Dr. Bao-Ji Chen, Minister of Agriculture, Dr. Chien Chung, National Security Council, H.E. Simon S.Y. Ko, Vice Minister of Foreign Affairs. Prof. Leshem visited Taiwan in 1998 as part of a deputation of the organization BirdLife International, and was hosted by the Mayor of Taipei, Prof. Ma Ying-Jeou, who paid a reciprocal visit to the International Center for the Study of Bird Migration at Latrun on 19.9.1999. In later years Prof. Ma was elected as President of Taiwan, and following this the Taiwanese Ambassador, Liang-Jen Chang, and Yossi Leshem, arranged to host an eminent deputation in Israel headed by General Liao Jung-Hsin, a senior Mirage pilot in the Taiwanese Air Force, and principally a sworn bird lover. 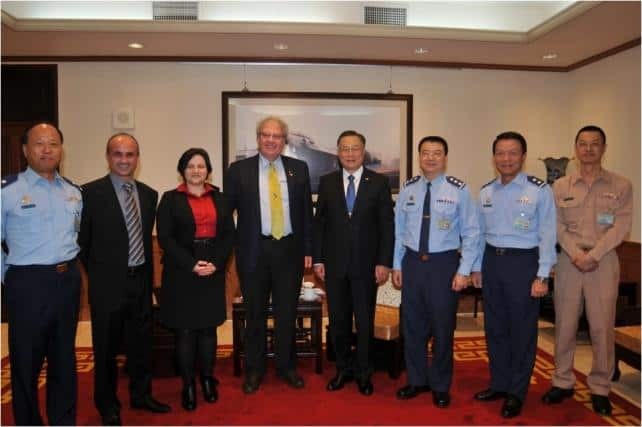 Following this visit, relations were cemented, and on 21.5.2012 when President Ma was sworn in to his second term, as a measure of friendship, Yossi was invited to represent Israel at the most impressive ceremony held in the capital Taipei at the Presidential Palace. Within this framework, he was invited together with our Ambassadress in Taiwan, H.E. Ms. Simona Halperin, to a preparatory meeting with the President. Prof. Lucia Liu Severinghaus from the Sinica Institute visited Israel, and made acquaintance with the successful Barn Owls project, and together we decided to propose agricultural collaboration on the subject of biological pest control. As a result, we presented a joint proposal to the President of Taiwan, and a budget for advancing a similar project in Taiwan was approved, funded by the Taiwanese Ministry of Agriculture. 23/10/2013 H.E. 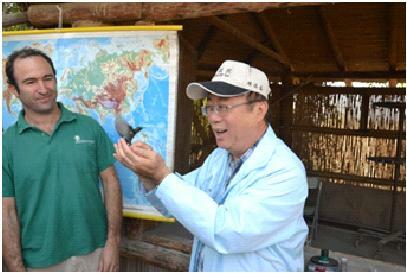 Dr. Bao Ji-Chen, the Taiwanese Minister of Agriculture, enjoys so much to release to the wild a male Palestine Sunbird at Kfar Ruppin ringing station. On his left, Nadav Israeli the professional bird ringer and Manager of the Birding Center at the Hula. 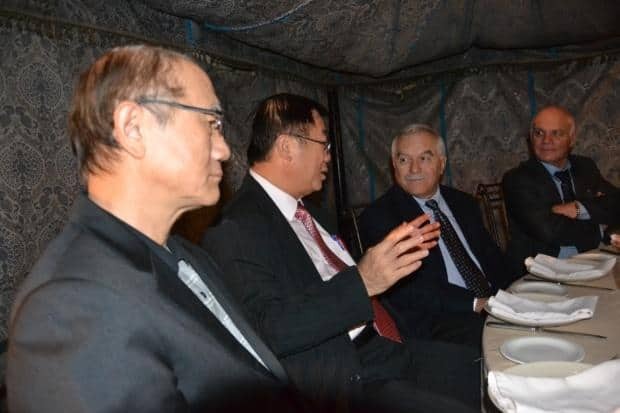 The Taiwanese Minister of Agriculture, Dr Bao-Ji Chen, came to Israel to visit the kibbutzim Sde Eliyah and Kfar Ruppin and was enchanted. The minister and twelve of his staff members were hosted by Prof. Yossi Leshem, Dr. Yoav Motaro, Shauli Aviel and David Glasner. The minister learned about the national project for the use of Barn Owls and Kestrels as biological pest control agents and attended the lecture by Prof. Yossi Leshem, head of the project. He also visited the ringing station at Kfar Ruppin, led by Nadav Israeli and was escorted around the Bio-Bee factory at Kibbutz Sde Eliyahu by Shauli Aviel. He was most enthusiastic and decided to develop the cooperation most significantly. A seminar was held in Taiwan between 10-14 November 2013 to which Yossi was invited, together with Dr. Motti Charter and Prof. Alexandre Roulin from the University of Lausanne in Switzerland, an international expert on Barn Owls, and also attended by experts from Malaysia (where extensive action in the oil plantations has been taken for exterminating rats) as well as experts from US and Taiwan. 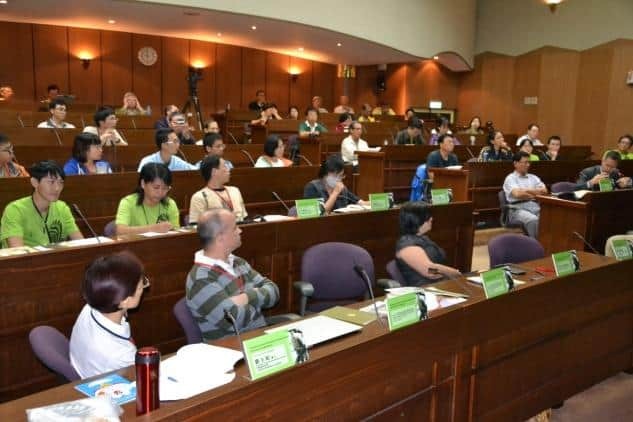 10-14/11/2013 The Biological Pest Control Conference in Taiwan, On the left corner: Prof. lucia and Prof. Roulin. After the conference, the project will be implemented in a defined area, and hopefully after its success, will be expanded to cover all of Taiwan. So also on the subject of Barn Owls, birds know no boundaries. Special thanks to the President of Taiwan, President Ma, and to General Liao Jung-Hsin who in the meantime has been appointed Deputy Chief of General Staff, to the Ambassador Liang-Jen Chang who doesn’t cease to push and promote the collaboration, and to our Ambassadress in Taiwan, Ms. Simona Halperin, and Prof. Lucia Liu Severinghaus. This article was first published in the Newsletter from Israel Number 13 February 2014. My personal thanks to Professor Yossi Leshem, Director of the International Center for the Study of Bird Migration in Latrun, for allowing me to publish his inspiring article on our blog. Kudo's to Israel for getting it right and leading the way! 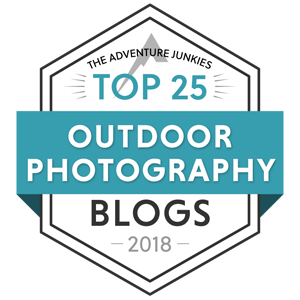 I accolade your insight! Kudo’s to Israel for getting it right and leading the way! I accolade your insight!